GaryMoller.com - Health, Fitness - Naturally! 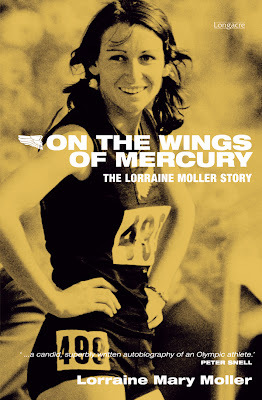 : "On the Wings of Mercury" - Lorraine Moller's autobiography has finally landed! "On the Wings of Mercury" - Lorraine Moller's autobiography has finally landed! What an absolutely fantastic book. "On the Wings of Mercury" is beautifully written and had me hooked from the outset. This book is hard to put down! It was just wonderful to read an autobiography that was so honest and explored the emotional and spiritual side of life and running. It's a reminder of all the things that have to be perfectly aligned (and the impediments that get in the way of that ideal state) for a champion runner to win big races, something that is often lost in the detail by mere mortals like me. Lorraine, you should be immensely proud of this book, it's likely to be an icon. 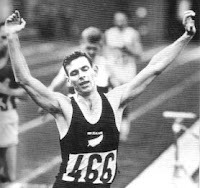 Foreword by Peter Snell "On the basis of consistent, world-class performances, Lorraine Moller has proven to be New Zealand’s greatest female distance runner. Her credentials include three victories in the Avon International Women’s Marathon, a win in the 1984 Boston Marathon and three times a winner of the prestigious Osaka International Ladies’ Marathon. In a feat still unmatched today, Lorraine completed four consecutive Olympic Games, commencing with the first marathon for women in the 1984 Los Angeles Olympic Games. The climax of her career was an Olympic bronze medal in the marathon at the 1992 Barcelona Olympic Games. On the Wings of Mercury is the most compelling autobiography I have ever read. Rather than a sports book filled with events and statistics, it is a book written by a sportswoman. Lorraine takes the reader on a fascinating odyssey: moving from her early childhood experiences, which helped shape her as a runner and person, through to the mature, articulate woman she is today — who at her best could beat anyone in the world. Lorraine is a storyteller of considerable skill and she writes with an outstanding command of language and use of metaphor. Throughout this powerful story she holds the reader’s attention and respect. It is unusual for an athlete to write their own story without journalistic assistance, but perhaps this is what has enabled Lorraine to better explore her innermost thoughts, her own motivations and spirituality. This is a candid, superbly written autobiography, providing the reader with a rare insight into the high and low experiences of an elite athlete". (When purchasing, please specify in the "comments" box who you want Lorraine's message addressed to, if it is intended as a gift to another person, thanks. If you find yourself lost, or are reticent about internet payments then just write me gary@myotec.co.nz and we can do the order manually).Note: Contains adult material - may not be suitable for under 18 years. "When I read one of the early drafts of the book, I could not put it down until it was finished. I confess that more than a few tears were shed in between the laughter. Sometimes I did not know whether to laugh or cry".